Koshi Tappu wildlife reserve is a protected area in the Tarai of eastern Nepal covering 175Km2, 68 sq of wetlands in the Sunsari, Sapttari and Udayapur District. It comprises extensive mudflats and freshwater marshes in the floodplain of the sapta Koshi River and range in altitude from 75 to 81m. 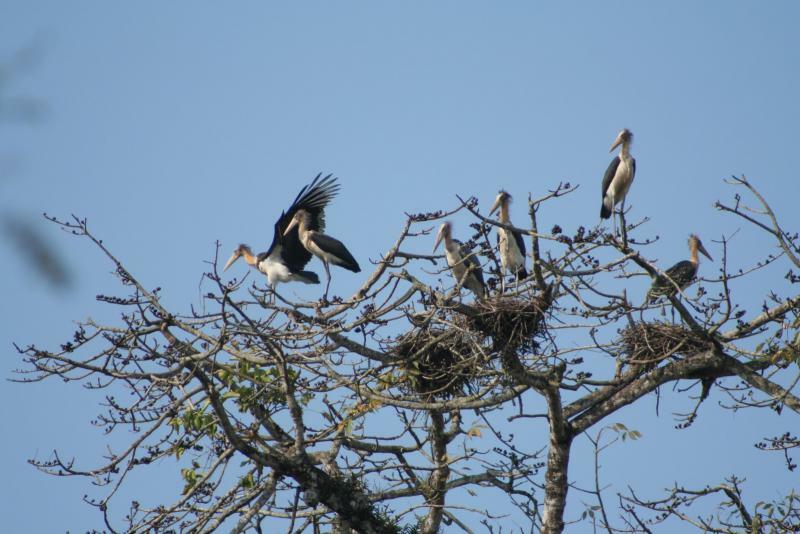 Parsa wildlife reserve is a protected area in the Inner Tarai lowlands of South central Nepal established in 1984 AD. It covers an area of 637.37Km2 (246.095sq m) in the Parsa, Makwanpur and Bara districts. It is the largest wildlife reserve in the country. A buffer zoon declared in 2005 comprises 299.2km2 (115.1sqm). Chituwan National Park is a preserved area in the Tarai lowland of south central Nepal, known for its bio diversity. Its dense forests and grassy plains are home of rare mammals like one – horned Rhinos and Bengal tiger. The park Shelters numerous birs species, including the giant hornbill Dugout canoes traverse the northern Rapti River, home of crocodile. Inside the park is Balmiki Ashram a Hindu Pilgrimage site. It’s 932Km2 (360sqm) , established 1973 and listed World Heritage site in 1984. Banke national park is located in the mid-western region Nepal and was established in 2010 as Nepal’s tenth national park after its recognition as a “gift to the earth”. Banke National Park is established in 2010 and area covered 550km2 (210sqm). Bardia National Park established in 1988 and area covering 968km2 (274sqm). Both Banke and Bardiya National park are covering 1518km2 (586sqm) areas. Shuklaphanta National park is a protection area in the Tarai of the far western region Nepal, covering 305km2 (118sqm) of open grassland forest riverbeds and tropical wetland at an altitude of 174 to 1386m. It was established in 1976 as Royal Shuklaphanta wildlife reserve. Day 2, Kathmandu – Koshi Tappu National Park for 2 Night 3 days package activities: Koshi Tappu wildlife reserve:The Koshi Tappu wildlife reserve is a protected area in the Tarai of eastern Nepal covering 175Km2, 68 sq of wetlands in the Sunsari, Sapttari and Udayapur District. It comprises extensive mudflats and freshwater marshes in the floodplain of the sapta Koshi River and range in altitude from 75 to 81m. Fly to Biratnagar after breakfast and drive to Koshi Tappu for lunch. Bird watching tour or depends …and overnight at Hotel. Day 3, Nature walks within near vicinity before breakfast and start raft boat ride on Sapta Koshi River to see dolphins and various water habitats. End boat trip by the banks of the river having picnic Lunch, short drive to Koshi barrage to view some bird life and fresh water dolphins’ late afternoon return to the Camp. Day 6, Drive to Chituwan National Park after breakfast and join for 2 Night 3 days package : Chituwan National Park is a preserved area in the Tarai lowland of south central Nepal, known for its bio diversity. Its dense forests and grassy plains are home of rare mammals like one – horned Rhinos and Bengal tiger. The park Shelters numerous birs species, including the giant hornbill Dugout canoes traverse the northern Rapti River, home of crocodile. Inside the park is Balmiki Ashram a Hindu Pilgrimage site. It’s 932Km2 (360sqm) , established 1973 and listed World Heritage site in 1984. Day 8, Early morning our well- trained and experienced naturalist takes you into prime spot for more than 450 species of exotic birds watching tour such as Kingfishers, parakeets, golden orioles, Peacocks, woodpecker etc. Drive to Banke and Bardiya National Park after breakfast for 3 nights 4 days package activities: Banke national park is located in the mid-western region Nepal and was established in 2010 as Nepal’s tenth national park after its recognition as a “gift to the earth”. Banke National Park is established in 2010 and area covered 550km2 (210sqm). Bardia National Park established in 1988 and area covering 968km2 (274sqm). Both Banke and Bardiya National park are covering 1518km2 (586sqm) areas. Day 9, Jungle Safari at Bardia National park which is a home to a few one horned Rhinoceros, tiger spotted deer, black buck , leopard, jackal as well as fresh water Dolphin and crocodile breeding center possible to visit. Day 10, Float safari, bird watching, Elephant Safari during day and Cultural dance program in the evening. Day 11, Drive to Shuklaphanta National Park 3 nights 4 days package tour : The Shuklaphanta National park is a protection area in the Tarai of the far western region Nepal, covering 305km2 (118sqm) of open grassland forest riverbeds and tropical wetland at an altitude of 174 to 1386m. It was established in 1976 as Royal Shuklaphanta wildlife reserve. Transfer to resort then introduction to your room, freshen up and briefing session, lunch then local village tour, cultural show, dinner and briefing about next day program. Day 12, Early morning after breakfast set out for excursion, bird watching, nature walk, lunch, jungle drive wild animal tracking, dinner and briefing about next day program. DAY 13, Bird watching tour in the morning breakfast then transfer to the Dhangadi, airport for fly return to Kathmandu and overnight at hotel.